Being the newest member to the DT I hadn't had any time at all to get to know Cebelica, but her projects were always great and I shall be sure to contiune to follow her blog to see how things are going. So we are looking for a few more DT gals... so if you fancy being part of a friendly (well I can't put mad!!) group of ladies just pop DT after your name and we will let you know!! As part of the DT you get a 10% discount to the store and occasional images from our fabby sponsors!! So come on what are you waiting for...... and don't forget about the DT call!!! I love the little monsters ! He looks fab Trudie ! Hi Trudie! This is a great bookmark and the color combination is wonderful - perfect for the little monster. ;D I love that tag too! 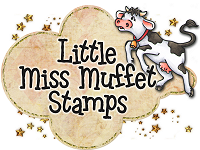 Thanks for using a Little Miss Muffet Stamp and feel free to add this project to our current challenge starting tomorrow... it doesn't even have to follow the theme!